For the most flavorful, moist sausages, cook the links slowly under relatively low heat. Slow cooking ensures that the sausage cooks evenly, as cooking too quickly results in sausage that is golden brown on the outside but still pink on the inside. Slow cooking also prevents the outer casing from splitting under high temperatures. No matter what cooking method you use, ensure you take the internal temperature measurement at the thickest part of the sausage. While pan-frying is the quickest cooking method, it's critical to cook the meat slowly enough that the inside is completely cooked. Preheat a heavy skillet over med low heat, then place the sausage in the warm pan. When the sausage is brown, use tongs to turn it to the other side. Don't use a fork to turn the sausage, as piercing the skin allows moisture to escape. When both sides are brown, place a small amount of water in the pan. Cover the pan and allow the sausage links to cook until they reach an internal temperature of at least 165 degrees F. Remove the pan from the heat and allow the sausage to rest for five to six minutes before serving. Poaching is an effective way to cook link sausage slowly so that moisture and flavor are intact. To poach sausage, place the sausage in a heavy skillet, then cover the sausage with broth, water or other liquid. Bring the liquid to a simmer and place the lid on the pan. Let the sausages remain in the simmering water until the internal temperature reaches 165 degrees F. If you like, cook the sausages until the sausage is done and the liquid has boiled down. Add a small amount of canola oil or olive oil, then cook lightly to brown the sausage. You can also poach sausage, then finish cooking it by pan-frying or on a grill. Grill sausage links on a gas or charcoal grill. If you use a gas grill, heat the grill to medium or medium-low, then cook the sausage until it reaches an internal temperature of 165 degrees F or more. Use tongs to turn the sausage halfway through the cooking time. 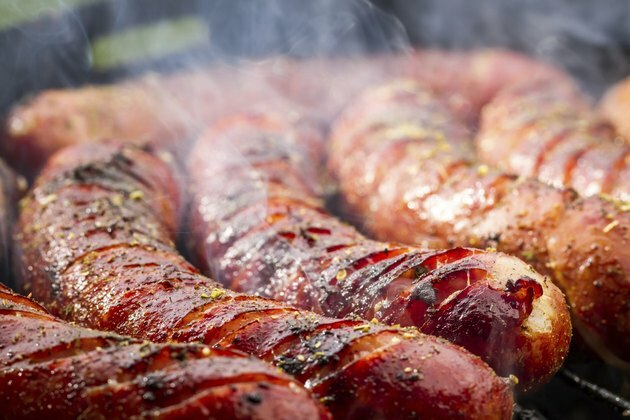 Over a charcoal grill, place the sausages on the outer edge of the grill to move them away from direct heat and prevent the sausage from cooking too quickly. If you like, poach the sausage in liquid first, then transfer them to the grill for browning. An average sausage link contains approximately 210 calories, 19 grams of fat and 562 milligrams of sodium. For a healthier option, you can choose vegetarian and soy-based sausages which will reduce fat and calorie content, and this may also lessen sodium. You can also try chicken sausage.